Based on the details of the Diablo Highway crime scene, in this Fingerprint Analysis Lab students learn how to identify the characteristics of fingerprints. They will analyze the fingerprint control samples and the fingerprint evidence provided and then make a determination as to which of the suspects or victims the fingerprint evidence may belong. Fingerprints do not change over the duration of an individual’s lifetime. Fingerprints have patterns that enable them to be systematically identified. The challenge for educators is how to present fun and engaging science lab activities that help their students achieve the objectives outlined in the NGSS. Diablo Highway: Fingerprint Analysis (Option A) is such a lab activity. Asking questions (for science) and defining problems (for engineering) – The essential question for students conducting the Diablo Highway: Fingerprint Analysis (Option A) Lab activity is Who committed the crime? In order to answer that question, the students must ask themselves: How can I determine who committed the crime? and then through a series of lessons and lab activities they learn the science, apply the science, gather and interpret data and come to a reasoned determination based on evidence. In Diablo Highway: Fingerprint Analysis (Option A), the questions arise from the need to solve a problem. Developing and using models – One of the key models used by students in Diablo Highway: Fingerprint Analysis (Option A) is the crime scene map. All the evidence is mapped here which forms the basis for the student's investigation and their resulting determinations. According to the NGSS, a diagram is considered a model. This model can show relationships among variables. In a simple example, what is the relationship between a sample of fingerprint evidence belonging to one of the victims and the location in which it was found? Planning and carrying out investigations – There are four engaging lab activities in the Diablo Highway: Fingerprint Analysis (Option A) lab. Teachers can choose to have students work individually or in groups to encourage collaborative problem-solving. Analyzing and interpreting data – In all of the Diablo Highway labs, and in the Fingerprint Analysis Lab in particular, students gather data in the course of their investigation, analyze it and interpret their data. This interpretation becomes the raw material in constructing the narrative of the crime and, ultimately, the arrival at a determination as to who may have committed this crime and how. Using mathematics and computational thinking – In the Diablo Highway Crime Scene Mapping Lab, (not included with Fingerprint Analysis Lab) students measure three-dimensional space and create an accurate model to represent this space. Constructing explanations (for science) and designing solutions (for engineering) – At the conclusion of the Diablo Highway: Fingerprint Analysis (Option A) lab, many teachers ask their students to write a report summarizing the results of their investigation including the evidence to support their determinations. Obtaining, evaluating, and communicating information – In the Fingerprint Analysis Lab, and throughout all nine of the lab activities in Diablo Highway, students evaluate the evidence from the crime scene, analyze this evidence in the lab and record this data. This data is compared with data from the control samples and a determination is made as to whom the fingerprint evidence may have originated. The NGSS Framework identifies seven crosscutting concepts that bridge disciplinary boundaries. Two of these crosscutting concepts in particular are strongly re-enforced in the Diablo Highway: Fingerprint Analysis (Option A) lab. 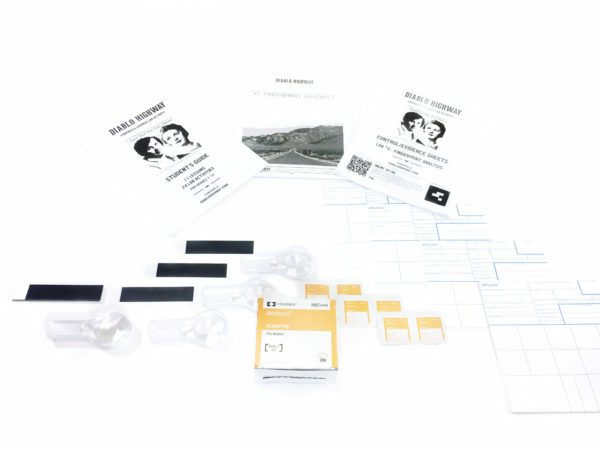 Conducting these lab activities in the Diablo Highway: Fingerprint Analysis (Option A) lab enables students to address the next two questions outlined the the NGSS crosscutting concept of Cause and Effect: moving from How did that happen? toward What mechanisms caused that to happen? and What conditions were critical for that to happen? As specified in the NGSS, for students, the very act of carrying out an investigation, which is the central focus of the Diablo Highway: Fingerprint Analysis (Option A) lab activities, addresses the core of the crosscutting concept of Cause and Effect. The Diablo Highway: Fingerprint Analysis (Option A) lab addresses this as well. In the culminating report, students present their case and supporting data. This compels them to argue from evidence when attributing fingerprint evidence to an owner. Further supporting the NGSS, solving this case helps students to understand that empirical evidence is required to differentiate between causation and correlation. It is made clear to the student, for example, that fingerprint evidence found on the victims, is a correlative connection to an individual but is not a causative connection between that individual and the murder of the two victims. Additional corroborative evidence is necessary to prove causation. Diablo Highway students use a variety of methods in the lab activities. 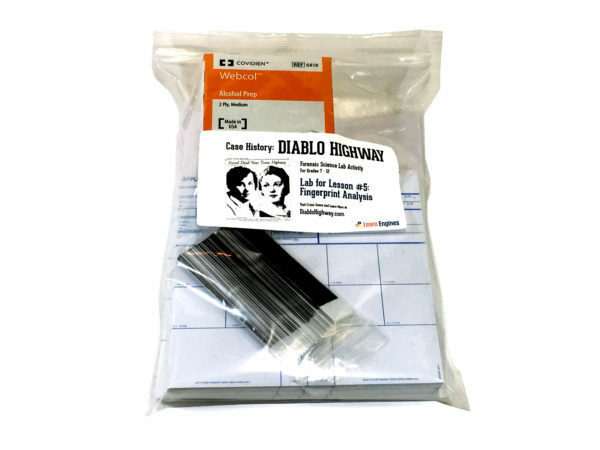 In the case of the Diablo Highway: Fingerprint Analysis (Option A) lab, these include observation, critical analysis, data recording and comparative analysis. Conducting the Diablo Highway: Fingerprint Analysis (Option A) lab, students use a variety of tools including a microscope, forceps, pipet, coverslips and slides. In the Diablo Highway: Fingerprint Analysis (Option A) lab, students conduct close analyses and interpretation of data for the fingerprint evidence and the control samples and accurately record their findings. The students’ determinations as to whom a piece of evidence might be associated with and ultimately who may have committed the crime are based on and supported by evidence – not speculation. In short, students make and defend a claim based on evidence and thereby come to understand the difference between cause and correlation. The forensic science labs conducted by students during this investigation reinforces this notion of an order and consistency in natural systems. The nature of fingerprints is such that fingerprints are unique, that they can be systematically identified and do not change over the duration of an individual’s lifetime. This is consistent. In supporting the NGSS, Diablo Highway therefore also supports these CCSS standards in literacy. 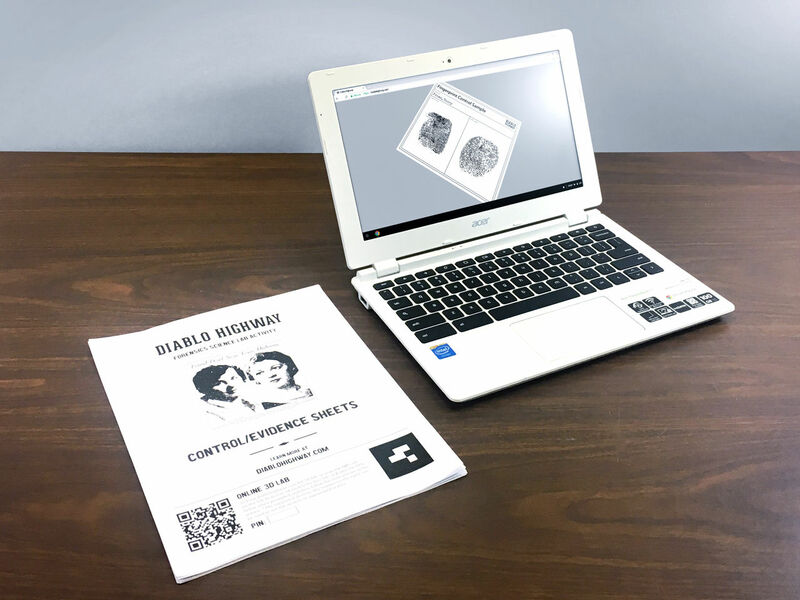 Diablo Highway: Fingerprint Analysis (Option A) lab provides primary written documents as an important basis for the understanding of the crime narrative upon which the science is based. 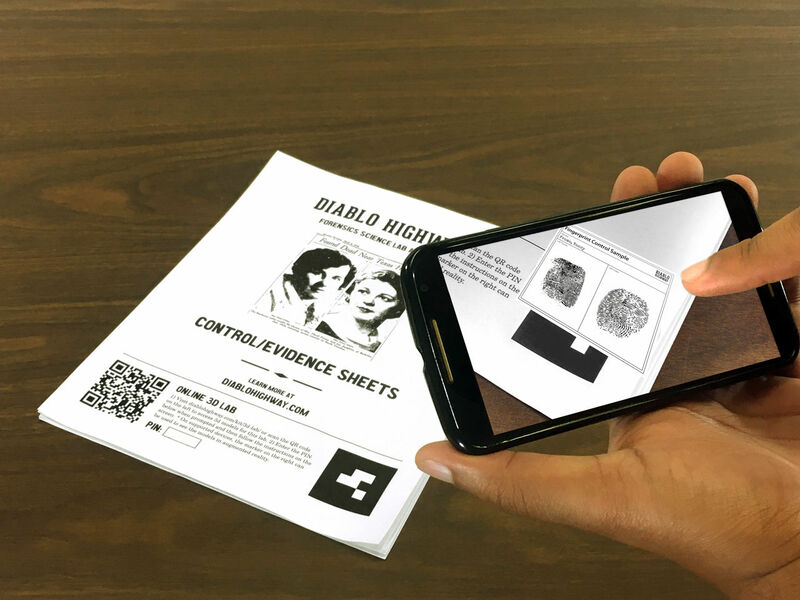 These include source documents such as newspaper articles about the crime, trial depositions and written documents used as evidence in the trial itself.